This page is dedicated to the G2 ponies of the My Little Pony line. This line existed from 1997 until 2003. In the US the line stopped around 1999 due to the unpopularity of the line. The G2s were very popular in Europe though and were in stores until 2003. The European ponies are more difficult to come by and have a wider price range. The average for a US release loose can range from $1 to $5 without any accessories. The average for a EU release loose can range from $4 to $15 without any accessories. There are a few exceptions like Hip Holly, which is from both the US and the EU, but is higher in price because she was called back from the stories due to the fact that she can become sticky. You can find a complete overview of the G2 ponies on this website. In contrary to the G1 line which had several Mail Order ponies, the G2 line had only one. Seabreeze was the only mail-order exclusive pony in the second generation line and was only for the US. Several twin sets were also offered in Europe, but these twins could also be purchased in stores. The European releases also have a few known variations in the line. Three of them are known now. Which are the 2002 Blue Pearl and White Pearl variants and the variant on the MO Seabreeze, which was released with the Garden Playcase in Spain, but the latter also turns up in other regions as well. 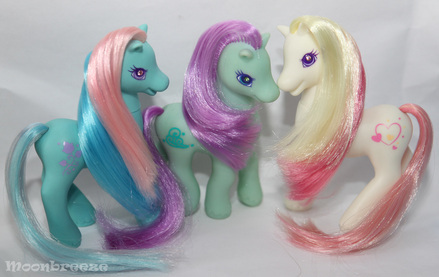 G2 ponies aimed for the European market have also been distributed in Australia. Packages with Dutch, Italian and Greek texts were available at 'Mr Toys Toyworld'. However the ponies after 1999 were discontinued in Australia, just like they were in the USA. Thank you, ​PCBabySunribbon for the info!